The sun rose at 1057am and set at 1327pm. The length of the day was 2 hours and 30 minutes. 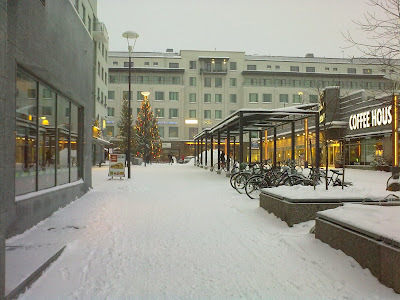 Back to mild temperature, -2°C (28F) in the morning. Christmas preparations are taking most of my time at the moment. 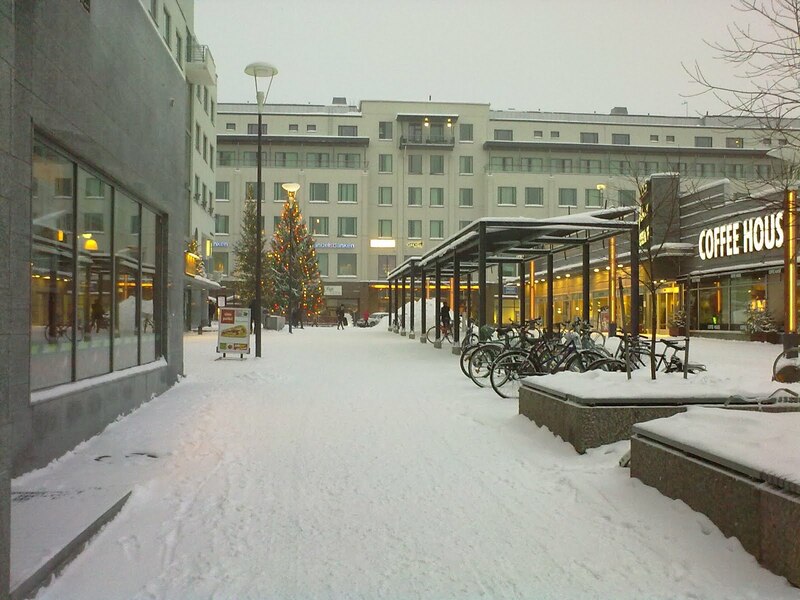 Here a view from the town center right at noon. As you can see, the day is grey. It looks cozy over by the coffee shop. I cant believe folk ride their bikes in the snow ! Thank you for sharing, so those of us in too-warm climates (Texas) can enjoy! great photo...thanks for the update! strange word verification : dermeto? One of the first things about Finland I learned was the importance of kahvia. One of the first sentences: Saako olla kahvia? When it's cold and grey outside a warm cup in the hand is a treat ! Coffee, tea, chocolate, herbal tea, I like them all ! When asked if I drink coffee, I tell people I'm genetically programmed to drink lots of coffee because I'm half Finnish. Up North Michigan and Minnesota, where there are lots of Suomalais-Amerikalainens, everyone who orders coffee with a meal in a restaurant gets their own pot. But my mother taught me that when visiting, once the coffee comes out after the voilaleipoyta, it's time to leave. That's the polite indication that your visit is over. I love your photo's. 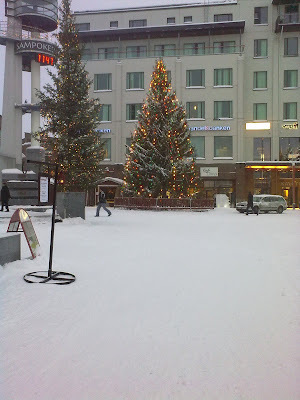 I was in Helsinki 6 years ago at this time of year and just loved the place and the people. 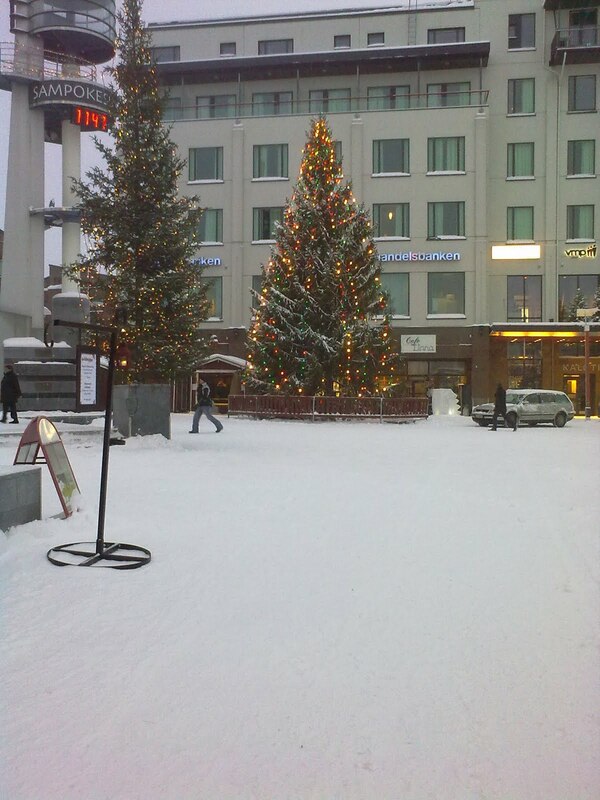 Just yesterday morning, before I read your post, I was thinking of writing to ask you to send us some photos of your town and -- surprise -- that's exactly what appeared! It is such a treat to see your beautiful corner of the world, both countryside and town. More photos are always welcome. Thank you for all you contribute to the creative world. Happy holidays to you and your family. So snowy! I just heard this about the coffee and it's being time to leave somewhere else, but I can't remember where.